CME Xkey is the generation of professional music keyboard, it is an elegant work of art, a fine instrument that follows you wherever you go. The black and white keys are supported by a cool silver color aluminum panel arching down at the front and a holder hidden at the rear bottom. These silky smooth keys intertwined with the aluminum grille. It presents a beautiful picture that the keys are like floating evenly at the edge of a waterfall. the body of the Xkey is housed into a piece of molded aluminum. The thickness is merely 3.6mm. Weighing at around 600g, the Xkey is even lighter than the iPad. With the slim and light form factor of the Xkey, it can be completely put into standard size backpack. Xkey not only inherited the essence of the piano keyboard, also succeeded beyond the limits of traditional music keyboard design that with the rugged and lightweight mobile features perfectly together. under each key and button, there is a customized pressure sensor connects to the intelligent circuit board with high-processing power. The intelligent circuit board produces details of the performances at very low power consumption. Such details including the 128-step full range of velocity intensity and the corresponding polyphonic after-touch control, up to 16,000-step pitch-bend control, and real-time response speed manipulation. the key layout of Xkey follows exactly octave range of traditional piano in accordance with professional keyboard player’s finger memories and playing habits. 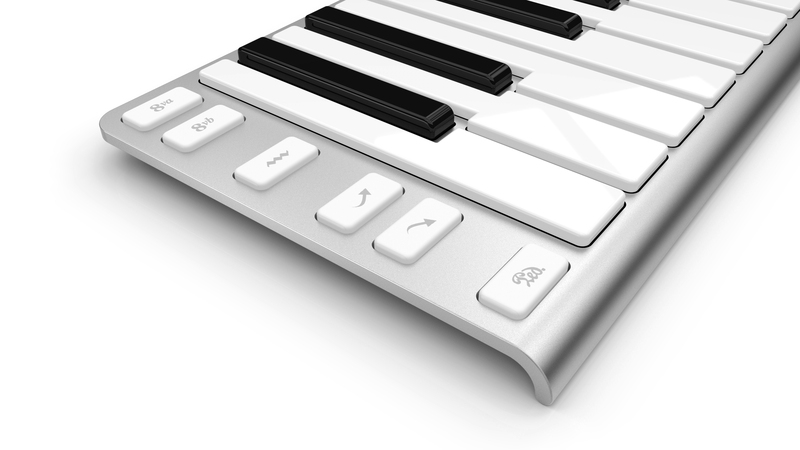 Aluminum grille is used to clearly separate each key in order to ensure that the player can locate key positions while playing blindly on the keyboard. The structure of each individual key is designed in such a way that the entire key moves down at the same level when it is pressed at any part on the key. Such design gives unified sense of touch to the player. The free version of XK-1 includes 16 sounds. Connect your Xkey to your iPad with the Lightning to USB Camera Adapter (available from Apple) and unlock the full sound library of 168 presets for free exclusively. If you don’t yet own an Xkey the library is available through an in-app purchase at $2.99 USD. 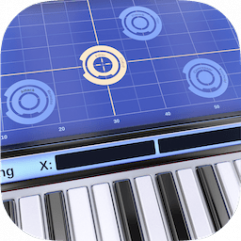 Available for iPhone and iPad with iOS 7.0 or later, now you can carry a powerful modern subtractive virtual analog synthesizer with you alongside your Xkey.